After buying my SR1 Mamod steam roller, I then looked to restoring it through painting different parts of the body and engine. 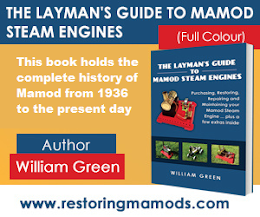 Through the guidance of pictures, I'll try to help you through painting a steam roller too or any other Mamod traction engine. You need to take into consideration that the engine gets extremely hot in different areas when steaming up. Therefore, you will need to spray these areas with high temperature paint so that it can put up with the high temperatures the engine goes through. Before you paint, you should always rub white spirit with a cloth over the parts you are going to paint. This removes any dust and particles from forming under the paint's skin decreasing the chances of rust and normal 'wear and tear'. If you apply the paint too heavily, it will start to look blotchy which you won't want. Apply each layer lightly and always make sure you are spraying with a motion (e.g. going from left to right). This makes sure that you are not applying too much paint to one area. If you do this for 5-10 times, the paintwork will look amazing. When painting the wheels of the steam roller, I chose to use some normal enamel spray paint in red. The wheels do not under go high temperatures. Therefore, any enamel red paint will work. But you are not using the 'Mamod' red paint that Mamod used on the wheels? This is true. However, the different in colour in barely noticeable. As long as I spray all the red parts of the engine in the same red, nobody will notice the difference. The SR1 Roller's wheel: preparing to be painted. With the main section of the engine, I had to take a different approach. Firstly, I started off by using high temperature glossy black paint. After that, I wanted to produce a different colour scheme for the engine. I attempted to go for a brass boiler natural look removing all green from the engine. However, this turned out the wrong decision. #1, it required a lot of work. #2, it scratched the boiler in attempting to get the paint off in the first place. #3, I was not going to dismantle the chrome work and box of the engine. Therefore, only the visible sections would be brass (which I wanted the whole boiler to be brass even if you couldn't see it). Removing the green paint proved to be a lot of hard work. From this, I then decided to paint the whole of it all in black. This would make it look a lot more neater and give it the look of the Mamod traction engine's colour scheme of all black with yellow wheels. The whole of the engine sprayed black. There's no need to worry about the chrome on the engine. that has been covered in masking tape to protect it. Therefore, it should contrast quite well with the black of the engine after it has been taking off! When spraying the wheels, don't worry about over spraying the sides. The paint can easily be removed with some wet and dry paper. I hope this has been an interesting read for you!